The population of this planet thinks the night is nothing more than the mane of a giant black astral chimera. 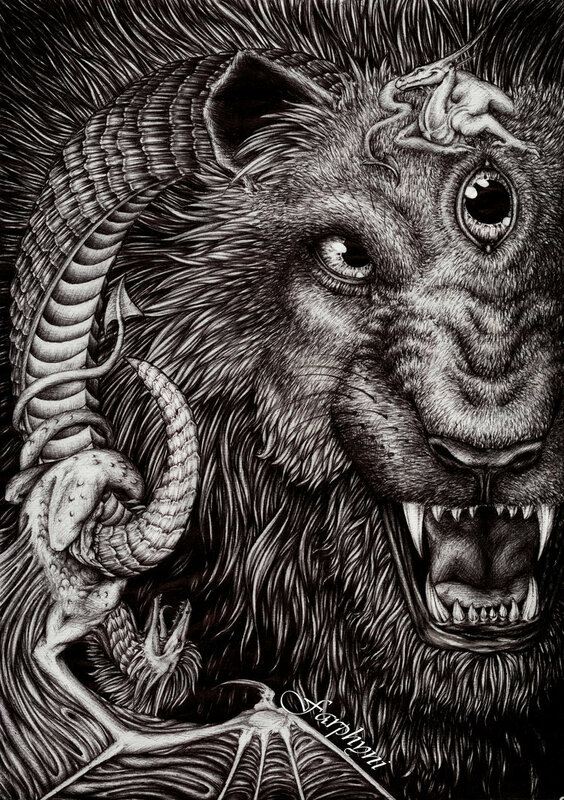 This Chimera is called Oíche’Rádala. All the time she’s running around the planet -behind her: the night. One day long, long ago one of the gods, Raawh the Goddess of the Shadows, wanted to see the whole world covered in shadows. To realize this all-time night she tried to take over the spirit of Oiche’Radala. But how did she do that? well, Radala has three eyes. The third one (the one in the middle) is some kind of “portal” to her mind. So Raawh turned into a spirit and entered Radalas mind through the third eye and took over her mind. That caused a solar eclipse. But the shadow couldn’t overcome the night for long. Soon Radala got rid of Raawh’ and she escaped Radalas anger. Now always when the population of this planet sees an solar eclipse they believe that Raawh tried again to take over Oiche’Radalas mind. Radals two companions are Whisper (who’s playing on her horn) and Swish (on her head). These two represent the fear of the people/creatures who are afraid of the night. Swish causes the noises in the night and Whisper creates the “talking” wind. About Oiche’Radalas counterpart: it’s a kind of phoenix-gryphon that chases sun around the planet. He’s called Trodaire’dóiteáin.